There's a gourmet market on the upper west side of Manhattan that's a staple of New York deliciousness. It's a Sunday morning bagels and lox temple as well as a purveyor of gourmet coffee, baked goods, fresh pastries and all the prepared foods you could ever want to stock your fridge with. And they make what is, arguably, one of the finest rugelach cookies anywhere. Someone I know loves those cookies very much. And I love him. The store, once a frequent weekend destination for us, is no longer so convenient. And while they do ship those cookies, too much freshness is lost in transit. Fortunately, I know how to bake and I'm a pretty good internet sleuth as well. 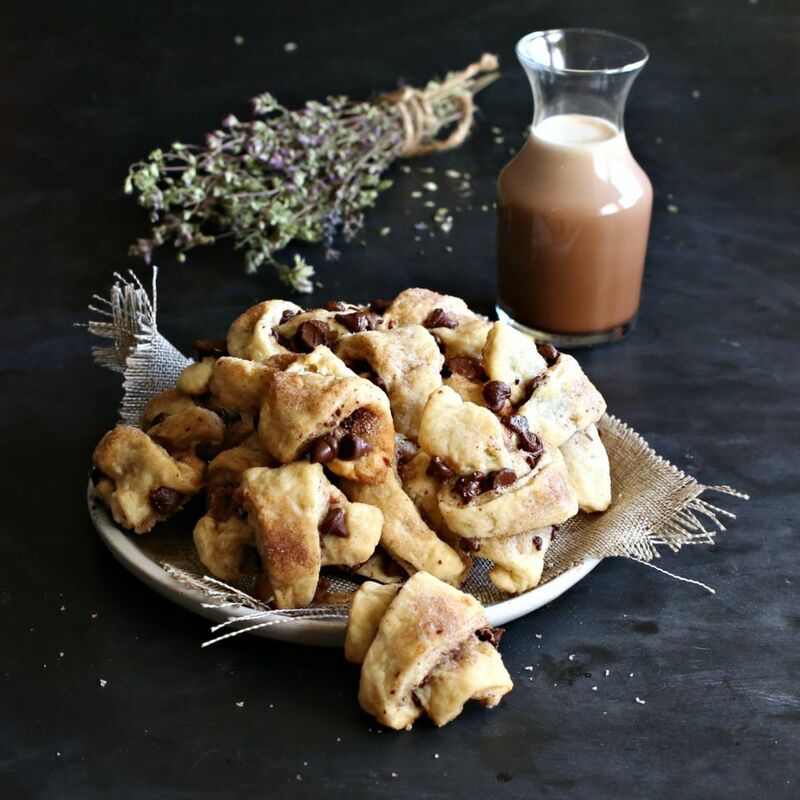 Most rugelach recipes use cream cheese in the dough but they don't taste like the beloved cookies. My sleuthing skills, though, discovered that the desired rugelach are baked with sour cream instead. And did I nail the recipe? The man I love, who loves the cookies, said I definitely did. Enjoy! Using a hand or stand mixer, cream together the egg yolk and sugar until lightened in color. Beat in the butter, sour cream and vanilla. Mix in the salt and all purpose flour until the mixture forms a thick dough. Cut into two pieces, wrap in plastic and refrigerate for at least 15 minutes. On a well floured surface, roll out each dough piece to approximately a 12" round. Sprinkle the chocolate chips evenly on both rounds. In a small bowl, combine the sugar, cinnamon, ground ginger, ground nutmeg and ground cardamom. Sprinkle the mixture evenly over both dough rounds. Using a knife or pizza cutter, divide each dough round into 8 pieces. Starting with the wider end, roll each piece up toward the center, to make the crescent shape, and place on a baking sheet lined with parchment paper. Sprinkle evenly with the cinnamon sugar and bake for 12 - 15 minutes until the chocolate melts and the dough is a light golden brown. Note that you can also roll out the dough to a rectangular shape instead of rounds, roll into a log and cut pieces with a knife. Where Can I Find a Rose Water Pistachio Hamantaschen recipe?